Today, for the first time in my life of 60 years, I see black chemtrails and black chemtrail clouds. I got out of my car, pulled to the side of the road and took these pics. You know, I thought I was running late for an event, but had I stepped out any earlier, I would have missed these, right before sunset. It amazes me how, I am the only one looking up. Can’t people see this? Why isn’t this on the news? What’s the Hell!!! BELOW FIND VIDEOS I HAVE TAKEN. I HAVE A SMALL CANON CAMERA SO IT HAS IT’S LIMITATIONS BUT YOU CAN GET THE GIST. BELOW IS A COLLECTION OF VIDEOS FOUND ON THE WEB. Imagine, how beautiful this world would be if this stopped???? 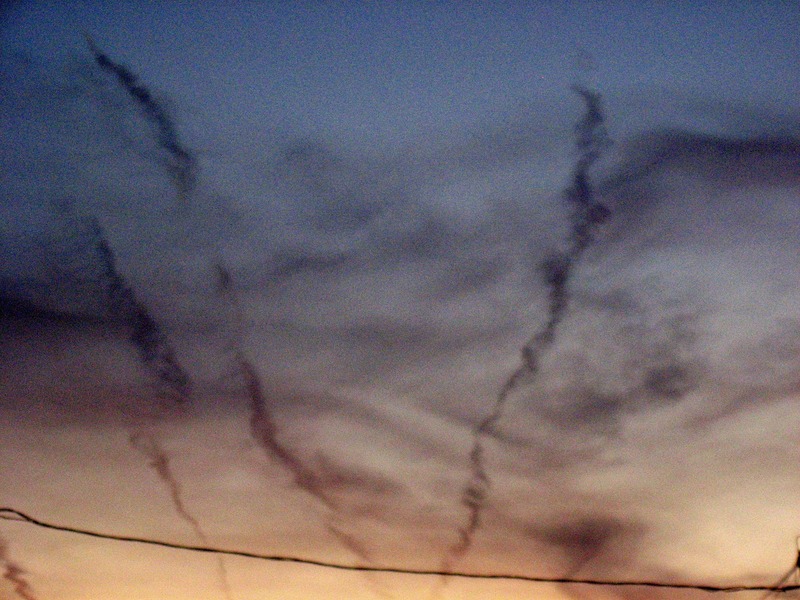 The Power Control Force must be getting a little nervous as more and more observations of what they are doing to the skies and the planet is being documented. So in my part of the world, they are spraying above the clouds I saw chemtrails above the clouds being distributed by planes and lines spreading out above the clouds. This seems to be creating a white milky blanket above the clouds and several weird cloud formations. This Milky white substance is spreading out, over, under and through the natural clouds. The Natural clouds seem to disintegrate within the mass around them, and as it spreads out there are fewer and fewer natural clouds. In some areas of the sky, there are no clouds, just this milky white blanket. In fact the substance they are spraying in the upper atmosphere is weighing heavily on the natural clouds pushing them down so that they appear within reach. This phenomenon is common in rural areas but not in the inner city. Of course there will be some explanation, but I have seen the lower clouds move in an easterly direction and the upper stuff move in a westerly direction (could be vice-versa, I ain't good with knowing which is which). At first I thought it was an obstacle illusion when one is moving and the others are stationary but even that is an anomaly. Lower clouds moving fast and upper cloud cover not moving at all?? Hmmm? seems strange to me. The clouds earlier today, were white and fluffy and beautiful. Above them was a milk mass of wispy feather stuff. This “stuff” began to spread out and that's what has become now a white milky cloud covering, like a plasmic dome is being created around our planet. I saw that in one of the Power Ranger episodes. Funny how they put this stuff in the animations for children to watch. Be back with pictures soon.